World War 2 actually started on the 1st of September 1939, when the German army attacked Poland. A German-Soviet agreement of August 23rd 1939 had stipulated that Lithuania would be under German influence, but that same year, in September 1939, it was decided by Germany and the Soviet Union that Lithuania would be under Soviet influence. According to this agreement on October 10th 1939, the Soviet Union returned Vilna to Lithuania, after it had been occupied by Poland. This included an area of 9000 sq.km. around the town, and Soviet troops were allowed to establish bases all over Lithuania. On June 15th 1940, Lithuania was forced to establish a regime friendly towards the Soviet Union, and after the new government headed by Justas Paleckis was installed, the Red Army took over Lithuania. President Smetona fled, Lithuanian leaders were exiled to Siberia, political parties were dissolved. A popular Seimas was elected, 99% of its members being communists, and unanimously decided that Lithuania would join the Soviet Union. Following new rules, the majority of factories and shops belonging to Jews of Utyan were nationalized and commissars were appointed to manage them. Most of the artisans were organized into cooperatives (Artels). Some flats and buildings were confiscated. There had been a short period of business prosperity after the Vilna region was annexed to Lithuania, when many of Vilnas Jews came to Utyan to visit relatives and do their shopping there. Several Jewish men, previously active in the Communist underground, now became important personalities, one of them being Faivush Ozer who was appointed to take charge of propaganda in the regional council of the communist party. In this job he also directed propaganda during elections for the popular Seimas, which decided to annex Lithuania to the USSR. Another Jew, named Berman, had an important job in the party's regional executive. All Zionist parties and youth organizations were disbanded and the Hebrew "Tarbuth" school was closed. The Yiddish school was broadened and became an official Soviet institution headed by teacher Fruma Bernshtein-Melamed. After part of Poland was annexed to Russia at the end of 1939, the students of the Radin Yeshivah arrived in Utyan as refugees and had been sheltered there with the help of special funds. In spite of sharp anti-religious propaganda spread by the new rulers, synagogues continued to be active, but the number of worshipers diminished. The Polish Yeshivah students, who tried to maintain their daily activities as usual, were auspicious amongst them. 14.Yekutiel Sheinis *; Hayim Burkan; (*) murdered in Rashe forest. In the middle of June 1941 several tens of Jewish families and also some singles, branded as "disloyal elements" and "enemies of the nation", were exiled by Soviet edict to the Altai region in Russia. Among them were owners of properties which had been nationalized, Zionist activists and others. 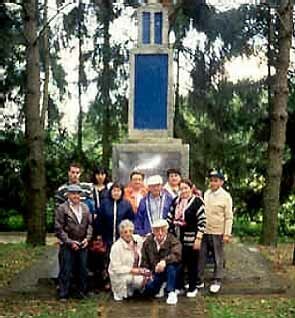 Some family heads who were imprisoned in labor camps, perished there. The German army entered Utyan on Wednesday, the 25th of June at 2 PM, the fourth day of the war, after bombing the town, and ruining several Jewish houses. Even before the Germans entered the town, Lithuanian nationalists took over local rule, began to bully local Jews and refugees who were passing through, pretending to search for weapons in Jewish houses, during which several Jews were murdered. After the Germans entered Utyan, Jews were taken to locate bombs and mines the Soviets had left behind, which also caused their deaths. The Lithuanians marked Jewish houses with the word "Jude", led German soldiers to them, and together they maltreated, hit and tortured their residents. One day they burst into the synagogues at the "Shulhoif" and threw out Torah scrolls and other sacred objects. The Rabbi of Aran, Tsevi-Ya'akov Bleiman, in Utyan on a visit, was taken from a neighboring flat where he was staying and forced to sing and dance with a Torah scroll in his hands. They then set all the books alight, shaved Rabbi Bleiman's beard, tortured and badly wounded him. Due to the treatment he received from his son-in-law, Dr.Yudelovitz, he recovered fast. According to orders, Jews now had to wear a yellow patch in the form of a Magen David on their clothing, on the back and on the chest. They were forbidden to walk on sidewalks, to buy or sell anything to a non Jew, and non Jews were forbidden to have any contact with them. The Lithuanians detained Jews whom they suspected of being communists, and the jail was filled with prisoners, including the two Jewish doctors Dr.Yudelovitz and Dr.Oks.. The synagogues too were used as jails for Jews, Russians and communists. On the morning of the14th of July, notices, signed by the towns mayor Dr. Stepanavicius and the military commander, were posted in the streets, announcing that all Utyan Jews must leave their houses by 12 PM on that day, take their identity cards and move in the direction of Maliat (Moletai). They were allowed to take what they wanted without any restrictions, but were forbidden to destroy remaining property. A warning was also published, saying that any Jew found in the town after the fixed time would be shot on the spot. On that day Lithuanian newspapers published, with great satisfaction, that Utyan was the first town in Lithuania to be "cleansed of Jews" (Judenrein). Even before the allotted time, Lithuanians ousted all the Jews, including the old, the ill and the invalids from their houses, hitting and abusing them. The sight of about 2,000 Utyan Jews leaving was terrible. It took just a few hours for them to be uprooted from their homes, which they and their ancestors had built and developed for generations. After the Jews left the town they were led to the nearby Shilali forest. There everybody had to appear before a special committee, whose members were from the town's intelligence amongst them a woman who registered their names and took their valuables from them, in particular gold and money. Whoever refused was shot immediately. The Jews were left in this forest for three weeks, surrounded by a heavy guard of Lithuanians. Due to rain and hunger many became ill, and also unable to receive medical help, because the doctors were in prison. Every morning the men were taken to work in town, where they saw Lithuanians and Germans removing Jewish property from their houses. The only food the people in the forest received was bread. The men returning from work sometimes managed to bring some food and milk, which was divided among the children and the sick. In these hard conditions there was friendship and comradeship among the Jews in the forest. On the 31st of July 1941 (7th of Av 5701), Lithuanian guards compiled a list of all men and women aged 17-55. Some of them, thought to be about 500 men, amongst them the towns Rabbi Nakhman Hirshovitz, the former Mayor Avraham Zhurat and his two sons, the wealthy Levior, the Shohet Yehuda Shafshtein and other important men, were taken away. All were murdered on that same day in the Rashe forest, about two km north of Utyan, and buried in previously prepared pits in a sandy area surrounded by swamps. The Jews in the forest, hearing the shooting, thought that Russian troops were approaching and that these would soon rescue them. Nobody reckoned that Lithuanians or Germans could engage in planned murder of innocent people, as the Germans and Lithuanians had spread rumors, which the people believed, that the men were working on a road. If not for these rumors, it could be that many Jews, in particular the youth, would have taken some initiative to rescue themselves. According to a German source, 235 men, 16 Jewish women, 4 Communists and 1 robber were shot at this place on that day. In the morning of the 7-th of August, another big group of the " fit for work" was led from the forest to the prison yard, where their documents, overcoats and trouser belts were taken from them. Then they were ordered to form lines and were led, guarded by armed Lithuanians, among them students and high school pupils, in the direction of Rashe forest for "so called" work. Near the forest they were ordered to run several km, hurried on by hitting, after which they were ordered to prostrate themselves on the earth. The women who had walked ahead, were ordered to proceed, and were then shot. After several minutes, some of the men were ordered to stand up and to proceed too. One of the survivors, probably the only one, recounted later that he saw long pits. A Lithuanian with a mask on his face stood by one of the pits, a whip in his hand and hit everyone who passed by. Fearing the whip, people run ahead to the pit, where a German stood and shot them with a machine gun. There was a car parked nearby, its passengers being the mayor, the district doctor and another person who, together with other Lithuanians, stood and watched the show. On the conclusion of the murders, the pits were covered with a layer of soil, later on covered with lime and then with another layer of earth. According to the findings of a Soviet investigation committee after the war, 8 pits were found on this murder site: the largest was 100 meters long, 4 m wide and 3 m deep. Parallel to this pit there were 2 more pits, one 30 m long, the other 20 m long. Then 5 more pits were found. "9,000 peaceful citizens, men, women, the old and children were buried in all these pits after having been shot, some of them still alive ". Scraps of clothing were found on the corpses, the men having worn 3-4 pairs of trousers and the women 3-4 dresses. "In this place the Hitlerist murderers and their local helpers in July-August 1941 murdered about 8000 Jews-men, women, children"
"Here the majority of Utyan Jews were murdered"
Jews from the towns of Ushpol (Uzpaliai), Avanaste, Inturik (Inturke), Dabeik (Dabeikiai), Vizhun (Vyzounos), Toragin (Tauragenai), Maliat (Moletai), Kuktishok (Kutkiskes), Radeik (Radeikiai), Shkumian (Skiemonys) were also murdered here. A few Jews, wandering through villages and forests in the surroundings, were caught and murdered. Except for those who managed to escape to Russia or to the Kovno Ghetto, no Utyan Jew survived. Only Tsadok Bleiman-Avitar, then a visitor in Utyan, was a witness to the murder and being wounded, managed to escape from the pit and arrive in Kovno. A girl named Feige Yofe was saved by the local priest and later became a Christian. The names of the 35 Lithuanian murderers and their German commander are recorded in the archives of Yad Vashem, as are the names of the few Lithuanians who endangered their lives and hid several Jews. One of the survivors of Utyan was Leib Sher, who fought as a partisan. .". According to the courts decision, the verdict was definite and no appeal possible, but it is not known whether they were executed. 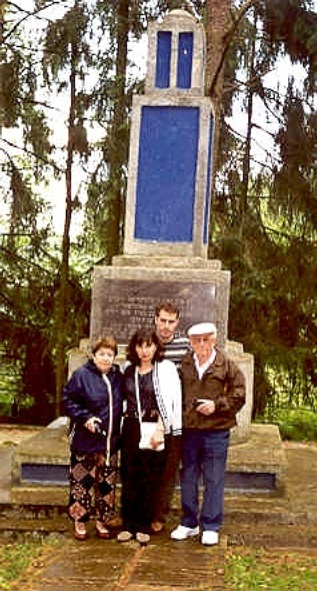 The remnants of the community, headed by Kalman Goldshtein, established a public committee which initiated the erection of a monument in memory of the murdered in Rashe forest, and on it an inscription in Hebrew and Yiddish, the first in Lithuania A channel was dug around the mass graves, to prevent damage from cattle. Every year survivors of the Utyan Jewish community would arrange a commemoration service there, also visiting the great Jewish cemetery. These visits saved the cemetery from destruction till 1965, when it was razed in accordance with the town's plan prepared by the Utyan municipality. The small Jewish cemetery was ruined earlier and its headstones used by nearby residents as building material. During the following years the authorities began to plot the yearly commemoration arrangements and also demanded that the inscription on the monument be changed. 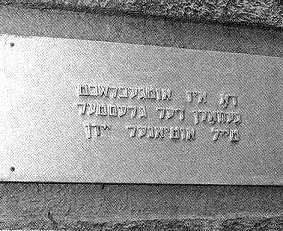 Despite the objection of the Jews to having a Lithuanian inscription on the monument and the intercession at the central committee of the communist party and the government, the old tablet was removed and a new one, with inscriptions in Lithuanian, Russian and Yiddish, was fixed instead. 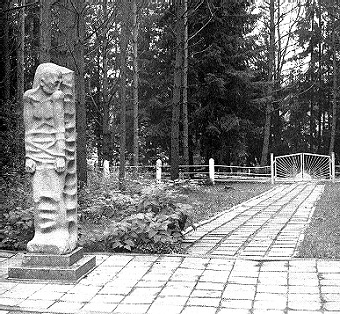 In August 1988 a big sculpture named "Pain" created by the Lithuanian artist Valentinas Simonelis was erected in Rashe forest. At the beginning of the nineties a monument in the shape of a three storey tower was erected at the murder site. The inscription on it, in Yiddish, says: "In this place the Hitlerist murderers and their local helpers murdered about 8,000 Jews, men, women and children on the 7-8 1941". 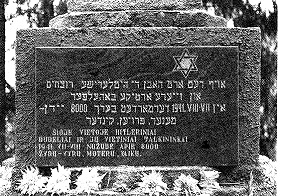 At the same time at the site of the old Jewish cemetery, a memorial was erected and on it the inscription in Yiddish and Lithuanian: "The old Jewish cemetery. Blessed is the memory of the deceased". In 1970 the Utyan municipality destroyed the 200 year old synagogue "Di Shul", whose front wall had been decorated by the local artist Yitshak Yofe. Most of the remaining Utyan Jews and their siblings immigrated to Israel. In 1970 there were 28 Jews in Utyan, in 1979  12, and by 1989 only 9 Jews remained. At the list of mass graves of the book "Mass murder in Lithuania" Vol. 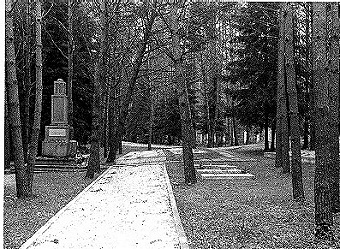 2, the mass grave of Utyan Jews appears as follows: The site-Rashe forest, 2 km north of Utyan; time-31.7.1941, 7.8.41, 29.8.41; number of murdered-about 4,000 men, women and children. 31.7.1941- 235 Jewish men, 16 Jewish women and 4 Lithuanian communists. 7.8.1941- 483 Jewish men, 87 Jewish women, and 1 Lithuanian who robbed the corpses of German soldiers. 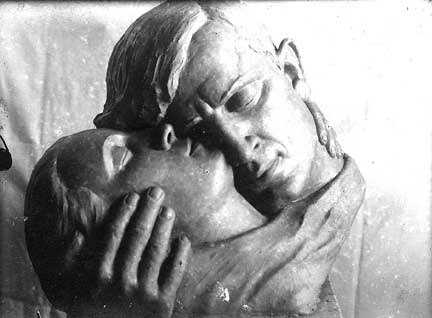 29.8.1941- in Utyan and Maliat- 582 Jewish men, 1,731 Jewish women and 1,469 Jewish children. All together 4,603 Jews. above them: Mirah Kuritsky-Kremer and her son Dani Kremer. Below: Hayim Kuritsky and his wife Hayah Kaplan. Yerushalmi Eliezer, Pinkas Shavli (Hebrew) Jerusalem 5709 (1948), pages 335, 375, 420. Report of the special government committee for investigation of the crimes committed by the Fascist-Germans and their helpers in Utyan district (Lithuanian). Pinkas haKehiloth. Lita (Encyclopedia of Jewish Settlements in Lithuania) (Hebrew), Editor: Dov Levin, Assistant editor: Yosef Rosin, Yad Vashem. Jerusalem 1996.